This is not an article about how to make your own laundry soap. There are lots of blogs and posts out there that cover this. I looked at one or two, or a dozen, and have since made my own laundry detergent for over a year. Not surprisingly, I have saved a lot of money–even if I spring for the more expensive Castile bar soap. In this time, the basics for me have remained: grated bar soap, super washing soda and a lot of water (my laundry soap version is liquid-ish–or, really, goopy-ish.) I have made a few tweaks along the way depending on what I had on hand or what I have learned. For example, I am having a love hate relationship with Borax. Yes, it is natural, but that doesn’t mean it’s okay. I mean, asbestos and cocaine are natural. Apparently Borax is really bad for your respiratory system, though I am not sure in what form it is damaging. In any case, I am currently hating Borax and not using it. Also, sometimes I will sell my soul a bit and use left over deodorant bars from hotels or vacations instead of buying the Castile soap from the store. But, hey, they’re free and would otherwise just be thrown away. But, again, this article is not really about how I make the laundry soap. Though, really, it’s so easy I can tell you in a few words. Fill big pot with hot water; grate and stir one bar soap into water until it melts; add one cup of super washing soda and bring to boil for a couple of minutes; let sit until cool enough to not melt the container you will pour it into. Seriously, that’s it. I soon hit upon a solution to the problem. Rather than focus so much on adding the essential oils to the detergent or the wash, I would focus instead on adding it to the drying part. At this point, I was no longer using dryer sheets, either, so again, that fresh laundry smell reminiscent of a snugly little bear was missing. But when you consider that the dryer sheets were just applying scent to the drying clothes, you realize that you can do the same thing. So, I mixed up a solution of water and essential oils in a small spray bottle and spritzed the clothes a couple of times before they were fully dry. It works! The smell lingers well after they are put away on the shelves and drawers. And it has the added benefit that it cuts down a bit on the static. You don’t need a lot of essential oils, either. In fact, you need to use them sparingly as the oils are often quite dark… and, well, they are oils–you wouldn’t want them to spot something. So shake up your little bottle before spraying the clothes! As a bonus, you can change up your scents quite often and make it unique to you! My laundry room is right off the garage entrance and I love coming in the house and smelling this month’s or week’s herbal blend. And, as a holy-crap-people-are-coming-over-and-I-haven’t-washed-couch-pillows-in-I-don’t-know-how-long option, you can use that same spray on your couch, pillows and rugs to freshen things up. The second challenge to using your own laundry soap is that once you strip all that cloying scent from your heavily soiled items like bathing towels and sheets, you start to wonder about whether they are truly clean. The home made detergent does a good job on normal clothes, but not these. That moldy wet smell just does not disappear from towels, and that sweat smell (from my husband–not me) never goes away from the sheets. Of course, these are thing you can’t just bleach. And, yes, I know that bleach is really bad for, well, everything, but I just can’t find a good substitute yet! Anyhow, moving on. In researching options to clean sheets and towels, I came across this solution: soaking the items in hot water for a couple of hours in a vinegar and washing soda solution. I put in about a cup of vinegar and a half cup of washing soda. Then, rinse, and do a normal laundry cycle with soap–again with hot water. Since I started doing this, I have truly felt that my towels and sheets were fresh and clean. Plus, drying them in the dryer and using the essential oil spray makes them smell even better! Keeping the sheets and towels apart also helps cut down on the amount of washing soda and vinegar you use. The third challenge is that you can’t rely on one detergent to do everything–though I don’t know if you ever really could. Or, you can’t reach for that chemical stick you bought at the store. My husband usually presents some interesting challenges–ink on work shirts, stained collars, and grease spots. Each of these issues means giving individual attention to the clothes, i.e., you really have to figure out how to attack that stain–but that’s what the internet and elbow grease are for. For example, on grease or oil stains, a little dab of dish washing detergent is a marvel. I just let it soak for a couple of hours before throwing it in with the regular wash. For the ink on the clothes, I don’t use a special chemical-laden product. I have found that rubbing alcohol on a cotton swab works amazingly well. And finally, having the basic ingredients for making your own laundry detergent means you always have something on hand to deal with tougher stains like ring around the collar–I just make a paste with the washing soda, apply it to the material, fold, and rub the two pieces of material together. I am sure other adjustments will continue to be made as I try to transition more fully to non-commercial products. For example, right now I still buy soap to grate for the laundry detergent. It’s a fairly basic Castile soap though it does have some fragrance combo that is not identified. I would like to wean myself away from that and I will be exploring making soap exclusively for the laundry detergent. I would love to hear about your experiments and experiences, so please share! Oh–and no women’s rights were harmed in the making of this blog post. I may wash the laundry–which my husband swears he still can’t do because there are too many options on the machine–but he folds it. And we all know that folding is the worst part of laundry! Holy cow … I made yogurt. Like, without a machine. You may not think it a big deal–though, really, when was the last time you made yogurt– but I was pretty daunted. I really enjoy cooking. But yogurt was … like, actual chemistry. It was scary to think that we would be consuming milk after we left it in the oven all night. However, we finally decided that paying $7.00 for the really good large container of Fage Greek yogurt was just too much. Sadly, the $6.00 price the prior several weeks was not too much. I don’t know why that one dollar broke the dam, but we had developed pretty high standards for yogurt. We wanted a really thick, high protein, creamy yogurt made without pectin. By the way, have you ever noticed that yogurt has pectin? Not that it’s bad for you, but it makes you feel like you’re eating milk jello. That’s why we eventually started getting the Fage Greek yogurt. It was thick without pectin. It’s delicious but expensive– and it isn’t even organic. So when it was no longer “on sale” we decided to explore other options. Or, rather, my husband looked at me and said, “I thought you said you can make yogurt at home?” I responded that, “well, sure, some people make yogurt at home.” I then immediately avoided eye contact. The truth is I had googled making yogurt at home several times. I had just never felt confident enough to make it. I finally just looked at him and asked if he was willing to experiment and possibly waste $4.29– the cost of a half-gallon of Kalona milk. This isn’t an article where I regurgitate someone else’s recipe as if I made it. And, really, it’s not even a recipe because you are just applying heat to milk. It’s more like directions. The ones I followed I found on the site The Kitchn. It didn’t require anything fancy– and it worked! It wasn’t completely smooth sailing. After the four hours the author recommends you check on it, my yogurt had not actually become yogurt. When I stirred it, I encouraged my self that it was thicker that the whole milk I had started with, but if that was true it was just barely thicker. I totally thought I had ruined it and wasted a half-gallon of really good milk. I immediately googled “trouble shooting ruined yogurt” and came across sage advice like “whatever you do, don’t stir it.” Well crap. Stirring it was the first thing I did. However, the instructions on The Kitchn reassured me that I could have left the milk soup in the oven overnight, so I decided to see what happened. It was like Christmas when I ran down first thing the next morning to open up my pot. And by golly, I made yogurt!!! Alas, that was not the end of it. I wanted really thick yogurt and what I had made was regular yogurt,even a bit runnier than regular yogurt. I then had to improvise a method to let the whey drain from the yogurt. I won’t even post a picture of my ridiculous set-up which consisted of a clean, thin tank top to strain the yogurt and several pony-tail holders chained together to wrap the shirt around a bowl. But it worked. It took another day but my end-product is thick, creamy, organic, and, I believe, high in protein. In the end, I saved money and made a better product. It was easy, though rather tedious, if I am going to be honest. That being said, I didn’t have to do much to it. It just took a while. Nonetheless, my husband keeps telling me it is the best yogurt he’s ever had and that he can’t believe I made it. So, yeah, I will probably add this to my homestead Sunday repertoire. This will have to go on the list of things that are surprisingly easy to make at home. Please, share your list of things that you found surprisingly easy to make at home. I have been experimenting quite a bit with making my own products, mostly for cleaning, though I have ventured into beauty products. Some projects have been a huge success, some have been failures (big ones), and others… I can’t figure out and have no scientific proof that it’s working or not working–though everyone on the internet seems to say it is. In a previous post, I went through my odyssey to create a safe, cheap, green alternative to expensive and chemicall-y all-purpose surface cleaner. That was one of my huge successes, by the way. I absolutely love the solution I have created. If you missed that article…well I just linked to it like five times, so go read it! As noted above, though, other experiments have been a little less successful, as you will see below. In this post I want to talk about the dishwasher and my quest for the right detergent. Let me begin by explaining that while I am sometimes motivated by avoiding harsh chemicals, in this product that was not my primary motivation. I mean, you don’t ever really handle dishwashing detergent, so it is hard to get a sense for its harshness. It was different with the all-purpose surface cleaner where I was concerned about what was remaining on surfaces, what I was inhaling, and what might unintentionally get on food. Also, I don’t have allergies, and quite frankly, have never even heard of an allergy to dishwashing detergent like you would for laundry detergent. It wasn’t so much the chemicals in my dishwashing detergent, it was the cost. The stuff is expensive! When my husband and I finally committed to our weekly grocery budget, I decided staying out of the household cleaners aisle completely would go a long way towards staying under budget. However, I put off trying to make the detergent for a while because my sister-in-law assurred me it wouldn’t work. Shaking her head in her been-there, done-that wisdom, she said, “no, it leaves stuff all over your dishes.” In the end, it’s not that I didn’t believe her. It’s just that I had decided my situation was different. Maybe it was her hard water, I thought. (honestly, I don’t even know if they had hard water… that just seems to be the go-to excuse with things being washed or rinsed.) Or… maybe she had a different recipe. Plus, I had already purchased Borax and Super Washing Soda for Laundry Detergent, so I pretty much already had all of the ingredients. And all these people on the internet said it was soooo easy and perfect. So, why not!? Like always, I hit the internet and found a recipe for the kind of detergent I could mold into shapes. These recipes were essentially the same as the powder detergents, but added a bit more of a wet ingredient to allow it to clump together. Recipes on-line were all very similar. They all pretty much used borax and super washing soda and some thing for an acid–vinegar, lemon juice, kool-aid (yes, kool-aid). Sometimes recipes also used regular baking soda, essential oils, and castille soap. I went with borax and super washing soda, vinegar, and a dash of Sal’s suds–not castille soap because we all learned from my eco-heroine, Lisa Bronner, in this amazing post that vinegar and castille soap do not mix. I mixed everything up until it clumped like sand for a sand castle and then pressed it into my little molds. 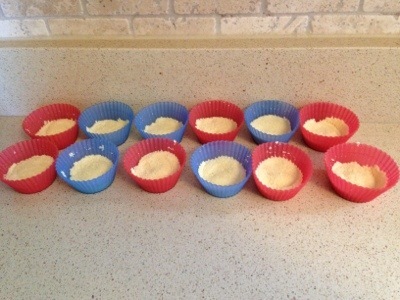 I have these nice silicone cupcake cups that I used, though I have also used plastic candy molds. Both work well, because the little guys can be popped out when fully dry. Depending how wet the mixture was, it would take anywhere from a few hours to a couple of days to dry. Like usual, my science wasn’t exact, so it varied a lot. Sometimes I had a sloppy mess from trying to remove the wet detergent from a mold too soon, or when I put in too much Sal’s Suds. More often than not, though, the stuff hardened up and I could place them individually in a re-used jar. And voila! I had loads and loads of detergent for mere pennies. I was so proud of my self. I felt like I was single-handedly saving the planet and our budget. But I was pre-maturely smug. And this is where I feel the internet and many blogs often lead us astray. They don’t really honestly explore the question about how well something works after someone brilliantly, cheaply, and easily makes something with their very own hands in their very own kitchen for the first time. You can often get a better sense of how something actually works from the comments to post than from the post itself. In my different batches, I would make little changes here and there…more vinegar, less vinegar, added vinegar to the wash cycle, or sometimes vingear soaked in citrus peels for some additional essential oils. I also added sometimes added essential oils, reduced the borax, etc. It really didn‘t matter what I did, my dishwasher left most of my dishes clean, but also left a white deposit on many dishes. It wasn’t necessarily a film (thought sometimes it was) it was more like these white Rorschach-test splotches on some of my dishes that I would have to scrub off before the next cycle or it would get caked on. Was I putting in too much detergent? Or was I putting in too much of one ingredient into the detergent, Borax or Super Washing Soda? I put in less… made adjustments to all of it. I still had the same problem. I don’t have hard water or soft-water, so I couldn’t figure it out. Still, I was stubborn. I convinced myself, and my husband, that it was not my beautiful, little, pressed pods that were a problem, but our dingy 15 year-old dishwasher. I felt sure that once we got a new dishwasher, everything would be spotless. So, we bought a new dishwasher (Aside–this was not as flippant a decision as it sounds. The dishwasher had not been performing well, was staring to leak, the nozzles were not nozzling and every cycle was leaving behind a lot of dried food particles. Plus we gave it away for free, so it lessened the guilt a bit about replacing an appliance.) We did not buy a top-of-the-line dishwasher, but solid, inexpensive one. I remained in denial for four cycles. And then had to admit that my dishwashing detergent was still leaving white stuff all over everything–though all the other problems were solved. We received two little Sample liquid pods of a name brand detergent that clearly did not leave the same residue behind. I admitted defeat… except, that I still have some thoughts about this. Perhaps the trick is to make my detergent liquid–or buy a Bosch, which we did not do, by the way. Sadly, I will not buy a Bosch but I will continue to try to experiment with the detergent…partially out of stubborness, but also because the stuff I am now using isn’t perfect, either. I actually switched to store-bought dry detergent (previously I used a name-brand or store-brand gel detergent). The store-brand I now have is fairly inexpensive per wash. However, I have noticed that while it does not leave large white splotches like my home made cleaner did, it does leave a white, cloudy layer on certain items. Especially over time and on plastic. So I am going to keep experimenting with making dishwashing detergent. I am not defeated. I am going to look for a liquid recipe. I even bought some citric acid because it was super cheap and is apparently the magic solution to crystal clear glasses. Meanwhile, the little pods I made are actually great for an all-natural scrubbing agent, kind of like a substitute for Comet. In fact, I just used it today to clean the shower. It worked beautifully. I also use some as an abrasive to get the tea and coffee stains out of our mugs–because no matter how good the dish washer or the detergent, those do not come off unless scrubbed! If anyone has any suggestions or comments, I would be happy to hear them! And I will keep you posted on my future experimentation. My transition into home made cleaners was gradual…and is actually still on-going. I started with the goal of making a basic all-purpose cleaner. As with most new ideas, I immediately got on-line and stole someone else’s. With the pride of an elementary school student I produced my first bottle and immediately started using it–I even showed it off to my husband and made him acknowledge my saavy. The recipe was one that you find quite often on green or better living web sites. It started with Dr. Bronner’s Castile soap, Vinegar, some essential oils, and water. I chose the lavender soap scent, because, well, I always choose lavender. I also added some lavender oil, as well as eucalyptus oil and tea tree oil. I also soaked some orange peel in vinegar for a few days until it turned orange and smelled more citrusy and less vinegary. I don’t know if this actually improved the efficacy of the vinegar, but marketers had long since convinced me that citrus cleans stuff and a website I saw somewhere recommended this, so I decided to go with it. I did not bother with distilled water. What I ended up making was a whole lot of nothing. It seems that the vinegar and the Castile Soap cancel each other out because–as a very helpful website established by a family member of Dr. Bronnner pointed out–vinegar is an acid and soap is a base. Duh. Check out the website is by the sister of the grandchildren of the founder, www.lisa.drbronner.com, specifically, http://lisa.drbronner.com/?p=292 for lots of nuggets of gold like this one. If you think about it, it is so obvious. It is possible that I put more soap in than vinegar, or the reverse, so that there was some cleaning power, but certainly not the super-powered cleaner I thought I was making. Plus it looked nasty. So the solution was either to make something just with the Castile soap and some essential oils and water, or use another product with vinegar. Incidentally, it does seem that regular old soap and water cleans plenty fine. However, the complaint seems to be that it would leave a film on your counters, which you are then supposed to follow up with a vinegar rinse. Now, I have light colored counters, so I don’t really know if the film would bother me, but this simple soap solution didn’t really seem complex to fight all those kitchen nasties. Plus, it’s like, two steps. Ms. Bronner recommended using another Dr. Bronner product, Sal Suds, it being not-quite-soap, and therefore, not a base. Hurrah, it can be mixed with my vinegar mixtures. I then ordered a big bottle of Sal Suds and got to work, adding my citrus vinegar (hey, no problems popped up with this little trick yet). This mixture was pleasant enough, though just the Sal Suds and vinegar with water mixture smelled a little to vinegary for my liking. The logical step was to add essential oils. These, after all, have their own antibacterial, anti-fungal, antimicrobial properties. Naturally, I already had lavender essential oils and tea tree oil. I started to do some research, though, on what essential oils had the best bad-stuff fighting properties. It seemed that the answer was oil of thyme. I have now produced several bottles of my home made cleaner. It smells wonderful. Herbal, fresh, and clean. I still experiment a little with oils and amounts, because the truth is I have no clue what I am doing, and I understand enough about chemistry to know that I never learned anything about solutions. My basic formula is one quarter cup Sal Suds, one ounce citrus vinegar, several drops of thyme oil and tea tree oil, and lavender and eucalyptus if I have it on hand. I am trying my best to figure out exactly how effective this solution I have is. It wipes things up very well and is all natural. Unfortunately, it is all the little things that you can’t see that you have to worry about. I need to find an eight grader willing to do a science experiment on this. So this story continues.